GPS Coordinates: 41º 10' 30.008'' N, 8º 36' 12.488'' W.
The GPS Coordinates to get to i3S are: 41º 10' 30.008'' N, 8º 36' 12.488'' W.
Please note that i3S does not have available park lots for this event. The easiest way to come to i3S is by metro. We are located in front of the metro station Pólo Universitário (yellow line – direction to Hospital de São João). Registration should be made at the main entrance hall and it will be open at 9 a.m.
Coffee- break and lunch will be served at the foyer next to the Corino de Andrade Auditorium. This conference is supported by the Discoveries Centre for Regeneration and Precision Medicine, and for the Norte2020. 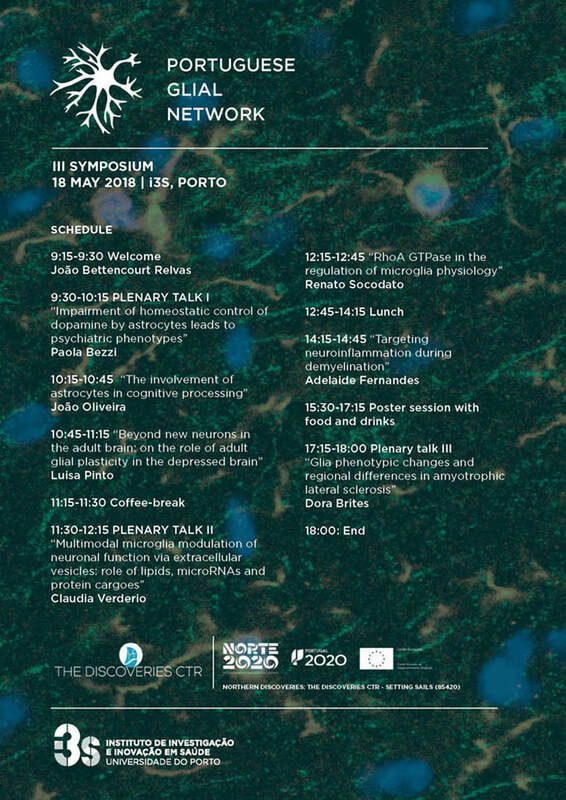 It is a joint initiative between the Portuguese Glial Network, i3S, and the Discoveries CTR.